Using a monochrome Japanese washi tape, artist Veronica Herber tears and places thousands of pieces of this medium onto a white background horizontally and vertically. This creates a mesmerizing and shimmering grid; an art work that at first, appears simplistic, but upon closer gaze reveals an intricacy, faultlessness, precision and contemplative space. These pieces invite us to lean in, look; and move around with our gaze. Our mind becomes free of narration and association and as a viewer, we can begin to simply contemplate and reflect on the form and process of the artwork. Numerical equations often make up the titles of Herber’s works, (for example 27 x44 x 2 =2376). These calculations relate to the thousands of pieces of torn paper that make up the grid and the coordinates of the tears. This approach appears to be following a geometric or scientific pattern, yet to read the artwork, as simply this is to miss its magic, its mysticism, and above all its meditative qualities. 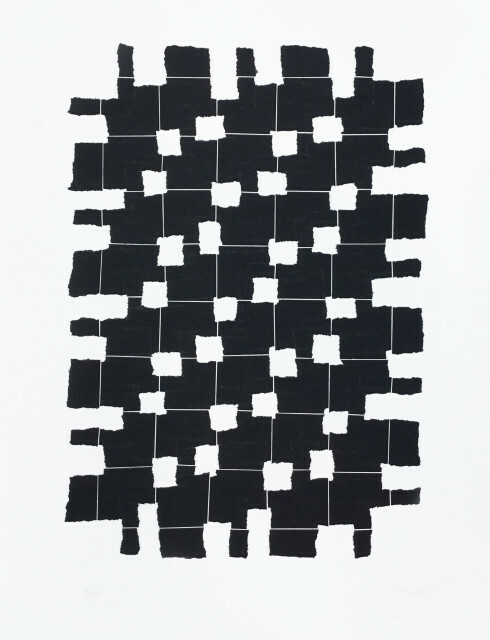 Herber begins each piece not knowing how the abstract grid will form. She talks of the tape and the paper almost leading her into the work and her being led by her own ‘intuition’ She states: “It’s a feeling of guidance, That is hard to put into words”. This leads to a process lead by repetition and instinct. In placing the torn feathered edges of the tape face inward, Herber softens the edges of the grid and leads us further into the work and its still presence. By creating the grid tear by small tear, Herber is lead by this process into an almost Zen like state. One of her influences is the Japanese aesthetic tradition of ‘Wabi Sabi’. In traditional Japanese aesthetics, wabi-sabi is a world view centered on the acceptance of transience and imperfection. The aesthetic is sometimes described as one of beauty that is "imperfect, impermanent, and incomplete". Herber also undertakes large interior and exterior installations and scultpture works. She originally began exploring her currrent practice by drawing with pencil, intricate works she called ‘drawdling’. Over time, in between attending Design School in Christchurch, raising a family and running a business (and then eventually completing a fine arts degree at Auckland University of Technology in 2006), Herber started to use washi tape as a replacement for drawing. She was inspired by her upbringing and her Father’s love of Modernsim, as well as being influenced by the Modernist painter Agnes Martin. After Herber graduated from AUT, she took part in various outdoor sculpture exhibtions in New Zealand and Australia, Cuba and Mexico.Her washi tape works (both large and small) have featured in several solo and group exhitbions and she received the James Wallace Arts Trust New Zealand scultptor award. Herbers washi tape work has also been included in several group exhibitions and has been at the center of three solo shows. She has been the of the James Wallace Arts Trust New Zealand Sculptor Award at Sculpture by the Sea Bondi (2015); the Titirangi Community Arts Council Emerging Artist Award and the Ebbett Prestige Environmental Award, Waitakaruru Sculpture Park (2012). Her work is in the collections of Chartwell Trust, Auckland Art Gallery Toi o Tāmaki and The James Wallace Arts Trust collection.